The Man of Steel Slot is a five reels Playtech slot with three rows and 25 paylines. The game is based on the 2013 Superman Movie with the original movie heroes. Playtech has developed this game in HTML 5, so the slot is playable on all popular mobile devices and on the desktop. A lot of action awaits you as the Man of Steel slot has several bonus features. There’s the World Engine Bonus feature, two different Free Spins feature and finally a progressive jackpot with 4 levels. Man of Steel is powerfull, entertaining and a must for slots fans. Symbols and Payouts: The Man of Steel Slot has only theme related icons with a whole bunch of heroes from the movie and some utilities. Last mentioned symbols are jets, buses, newspapers, cameras, glasses and post boxes. These symbols are the low payer up to 50x your bet with on a combination of 5 identical symbols. The high paying symbols include Superman itself, General Zod, Faora, Namek – these are all Wild Symbols and pay up to 1000x your bet. Other figures and symbols include the Superman logo, Martha Kane (played by Diane Lane), Jonathan Kent (played by Kevin Costner) and Perry White (played by Laurence Fishburne). Battle for Earth Free Spins: If Superman and General Zod land on your reels, you can trigger the Shifting Wild feature or the Battle for Earth Free Spins feature. The latter happens when both symbols land on the same row. You will spurt the free spins with 4 wild symbols Superman, General Zod, Faora and Namek. If one of the Wilds lands on a row with Superman, the fight will take place. With every fight of Superman you get an extra wild symbol. The feature ends only when Superman is defeated. Krypton Free Spins: The Krypton Free Spins feature is the actual Free Spins feature of the Man of Steel slot. To trigger it you have to land the World Engine Bonus scatter on your 5th reel. Then you play 7 Free Spins on a new set of reels with up to 10 sticky Jor-El Wilds. They stay on your reels for the entire feature. With another bonus scatter, you can even extend this feature and then play 14 free spins. Then you also get new Sticky Wilds on your reels. DC Heroes Jackpot Network: The Man of Steel Slot is part of the DC Super Heroes Jackpot network. This consists of 4 progressive jackpot levels, which you can randomly win with each spin. When the jackpot game starts, you have to find 1 of the 4 coloured jackpot symbols from 20 jackpot symbols. Each color of the jackpot symbol includes the matching jackpot, which is the Mini, Minor, Major or the biggest one the Grand Jackpot. Last named starts at £ 1 million! With the new DC Heroes slots, Playtech has launched a new series of top games. 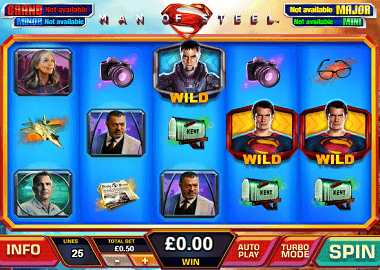 The Man of Steel slot has a lot of bonus features and is very entertaining. As is normal with a jackpot slot, you will need these features for bigger profits. We recommend you to play the Man of Steel slot here for free (click on the banner above). Then you can play the slot with real money, for example at BGO Casino, Powerspins or Mansion Casino Betfair Casino. For all mentioned casinos there are also super bonuses for newcomers. At Betfair Casino, you can even play 25 Free Spins without deposit.